CAMBRIDGE – Plastic waste fouls the ocean, poisons marine life, defaces the environment and clogs gutters and landfills; sticking around for years without breaking down and with no viable solution in sight. 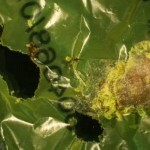 That was until the recent discovery that a caterpillar commercially bred for fishing bait has the ability to biodegrade polyethylene: one of the toughest and most used plastics in the form of store and supermarket shopping bags. The wax worm, the larvae of the greater wax moth, is a menace to beehives across Europe, where it lives as a parasite in bee colonies. Wax moths lay their eggs inside hives where the worms hatch and grow on beeswax. Quite by chance, scientist and amateur beekeeper Federica Bertocchini was removing the pests from the honeycombs in her hives. She temporarily put the caterpillars in an ordinary plastic shopping bag, which she subsequently found to be riddled with holes. Bertocchini, from Spain’s Institute of Biomedicine and Biotechnology of Cantabria (CSIC), went on to collaborate with colleagues Paolo Bombelli and Christopher Howe at Cambridge University’s Department of Biochemistry to conduct a timed experiment. In the experiment, about a hundred wax worms were exposed to a plastic supermarket bag. After just 40 minutes holes started to appear, and after 12 hours there was a reduction in plastic mass of 92mg. According to the scientists, this degradation rate was extremely fast compared to other discoveries, such as bacteria reported last year to biodegrade some plastics at a rate of 0.13mg a day. To confirm that it wasn’t simply the chewing mechanism of the caterpillars degrading the plastic, the team mashed some of the worms and smeared them on polyethylene bags, with similar results. “If a single enzyme is responsible for this chemical process, its reproduction on a large scale using biotechnological methods should be achievable,” said Paolo Bombelli, first author of the study, which was published on Monday in the journal Current Biology. Polyethylene is largely used in packaging, with around a trillion plastic bags used worldwide every year. It is generally highly resistant to breaking down, and even when it does the smaller pieces choke up ecosystems without degrading, taking a heavy environmental toll. Although the molecular detail of wax biodegradation requires further investigation, the researchers say it is likely that digesting beeswax and polyethylene involves breaking similar types of chemical bonds.